The White-winged Scoter is the largest and most known of the three species of Scoter. A stocky bird, both males and females have a white patch on the secondary feathers in their wings. This characteristic is unique to this scoter, making it easily recognized on its winter visits to Tennessee. Description: The male is black and has a crescent-shaped white patch that passes through the eye and a large orange bill with a black nasal knob. The female is a sooty brown color with two light oval face patches. In flight the white secondary feathers are very visible and can occasionally been seen when on the water. When lifting off the water White-winged Scoters run and fly along the surface for a short distance finally taking off in straight lines or “stings” flying low with heavy, labored wing beats. They prefer to spend their time diving and drifting on the water. Voice: Generally silent. Male and female make a harsh guttural croak. During courtship males make a thin whistle wher-er. Both sexes wings produce a whistling noise in certain flight displays. Black Scoter -The male sports all black plumage the black bill is thinner with a yellow-orange knob. Female has dark cap with clean whitish cheeks-not patches. Surf Scoter – Male has distinct white head patches, all black body and multi-colored large heavy bill. Female is dusky brown with white patches on sides of face and pale patch on nape. Habitat: In Tennessee White-winged Scoters can occasionally be found on large freshwater lakes. Status in Tennessee: The White-winged Scoter is an uncommon migrant in winter in Tennessee. 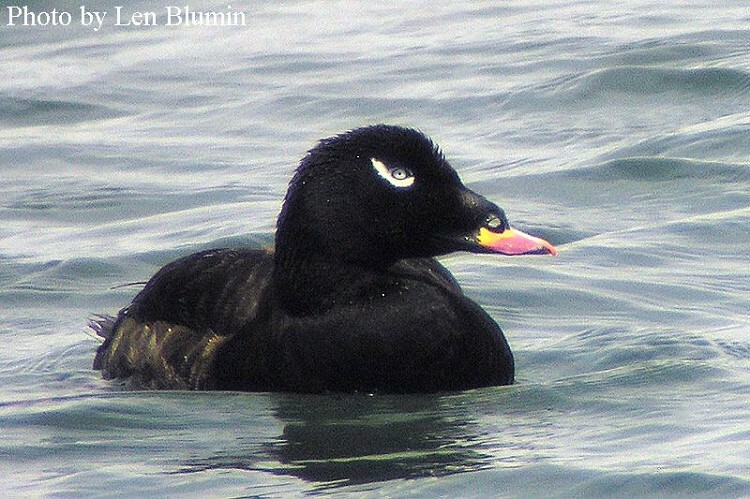 · White-winged Scoters can dive to depths of 40 feet to get to shellfish, their favorite food.